While having a home with cathedral ceilings so high that our voices echo might lie ahead in our future, for now, small spaces are simply a part of life for most of us. Luckily, there are lots of clever individuals who have discovered ways to fight this spatially challenged reality. From apartments to bungalows to even tiny homes, these living rooms feel much grander than they really are. 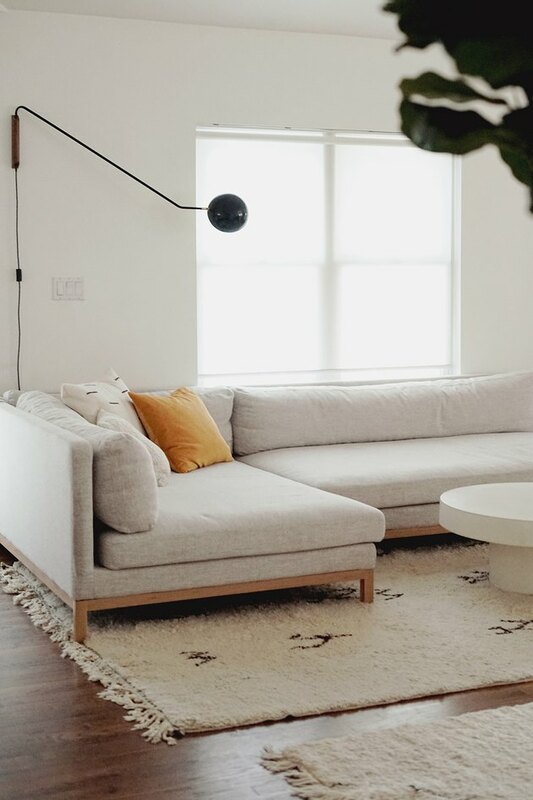 So grab your journals and start taking notes — ahead are seven ingenious tricks to make your living room seem downright palatial. 1. Draw the eyes up. Drawing the eye up is a tried-and-true trick used by designers for decades, but there are always fresh ways to try this out for yourself. As a designer and prop stylist, Brady Tolbert has welcomed this look in his own living room. 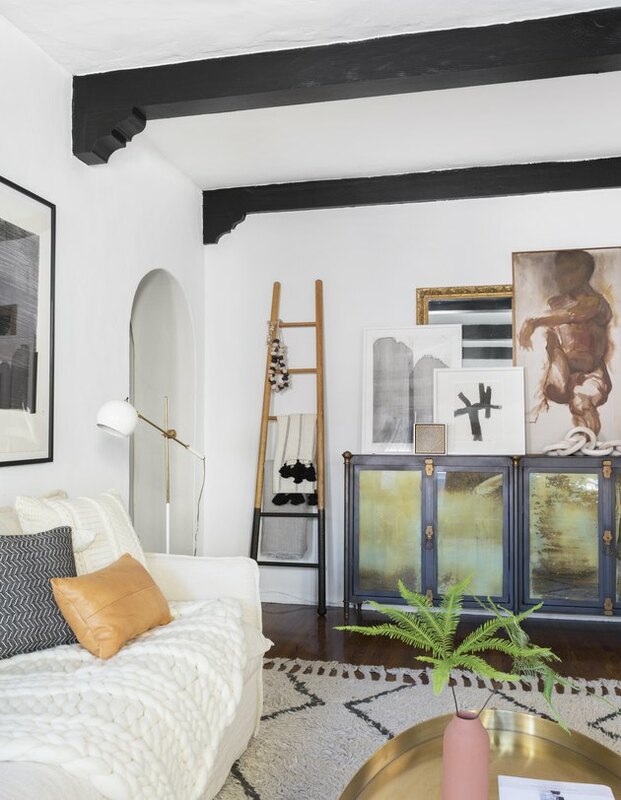 The layered artwork reaches toward the ceiling, and the ladder gives the space a tall appearance as well, while the black ceiling beams create even more visual interest, drawing the eyes up. 2. Install big, bright windows. If you have the ability to remodel your living room or you're starting from scratch, a wonderful way to invite more space is to install picture or floor-to-ceiling windows, like the ones seen in this space designed by Amber Lewis. The oversize sliding glass doors let in tons of light, and it almost feels as if the gorgeous scenery is an extension of the living room. 3. Paint the room white. An easy way to open up a room is to paint the walls white, and bonus points if you bring in neutral decor, too. 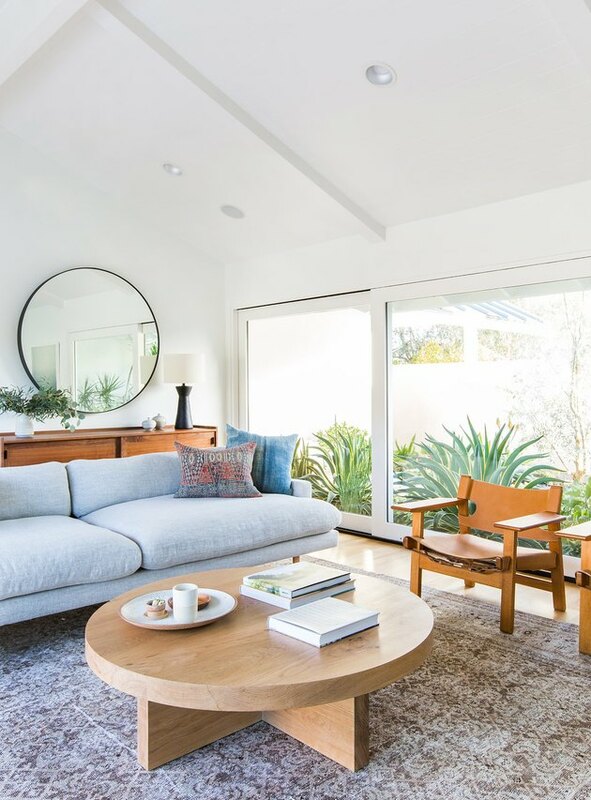 In this space designed by Holly and Hedda of Avenue Lifestyle, the white surroundings lend an airy feel, and the area rug, light fixture, and glass coffee table contribute breeziness to the room as well. 4. Discover clever spots for stashing storage. 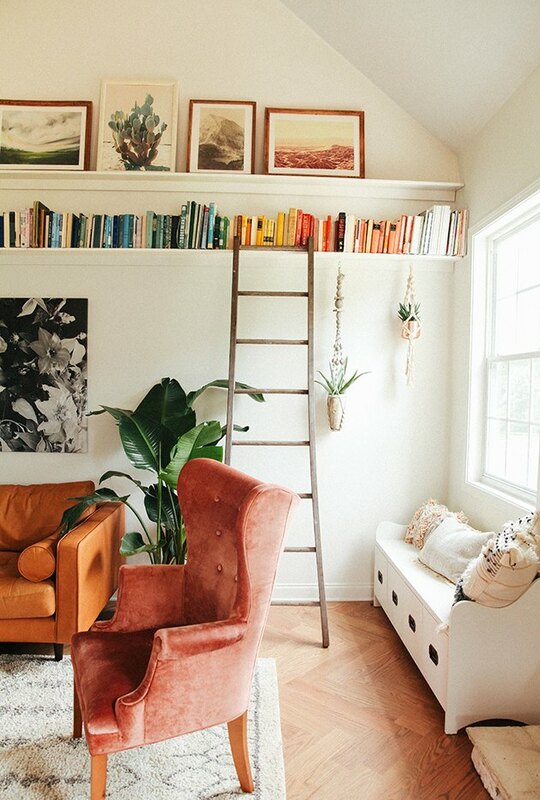 It can be a bummer if your living room doesn't have built-in shelving (otherwise known as a major space-saver). If you can't find room for a bookshelf or two, look elsewhere for storage opportunities. Can you buy a TV stand with cabinets? Stash a couple of baskets underneath the coffee table? That's what Shea from Studio McGee did in this living room. Plus, less clutter means your space will feel much larger. 5. Go minimal — very minimal. 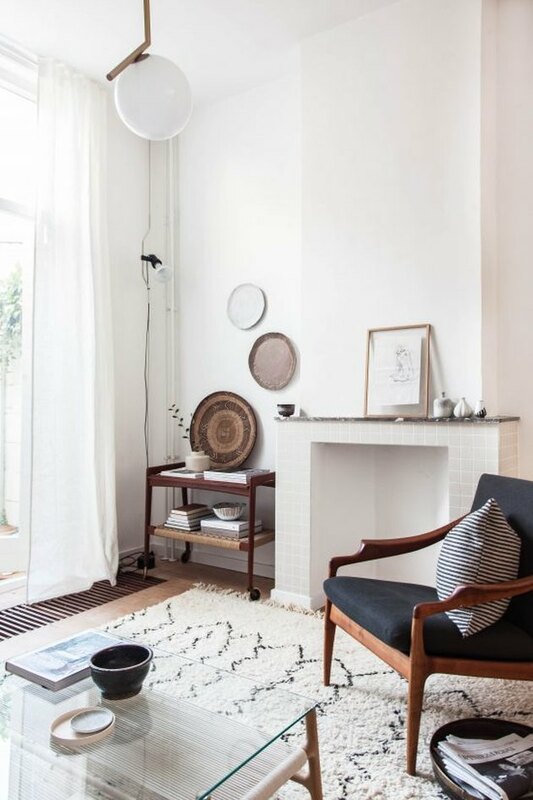 Even though we love maximalist decor, sometimes in a particularly diminutive space, it's better if you downsize. 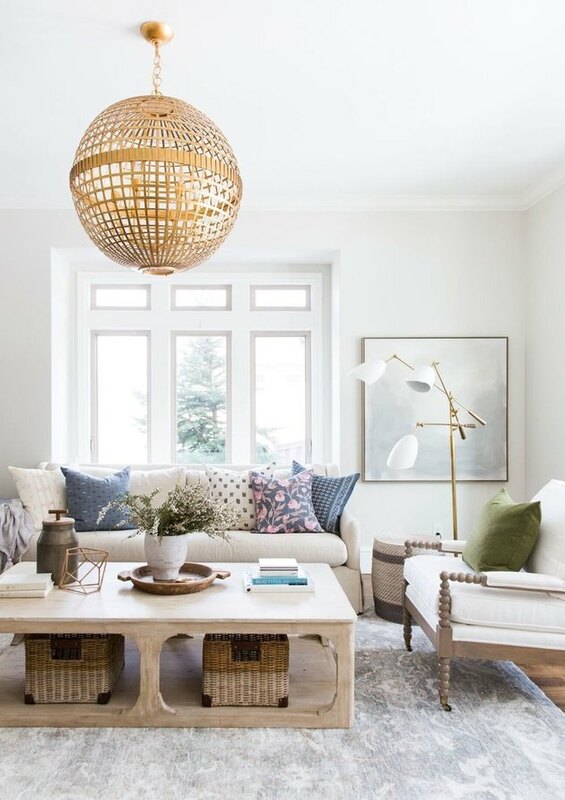 To make your living room seem bigger, you can just go for some stylish necessities, such as a streamlined sofa, a simple-yet-chic area rug, a modern lamp, and a few throw pillows, which is exactly what Molly of Almost Makes Perfect did in her living room. 6. Don’t shy away from color. You may think that a tiny living room can't handle your passion for color, but we're here to tell you that's not the case. If you weave in carefully chosen hues, as opposed to every color in the rainbow, you can still achieve a vibrant and cheerful space. 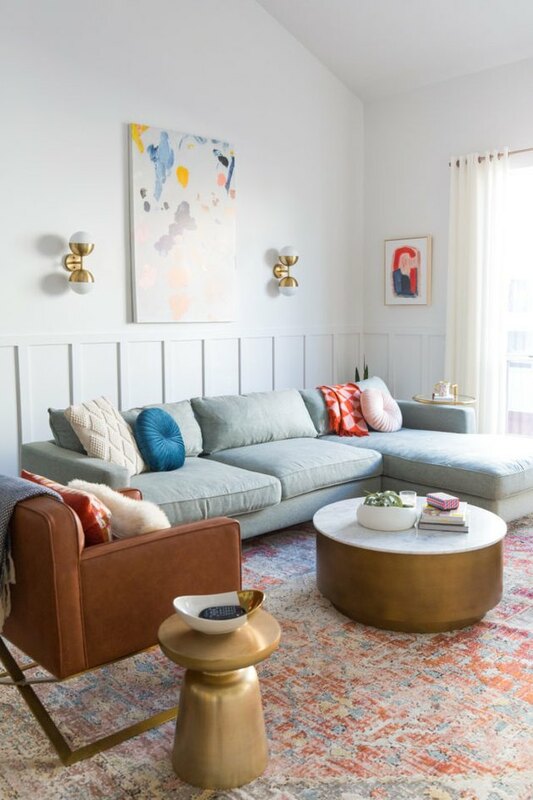 In this living room belonging to Ashley Rose from Sugar & Cloth, subtle shades are represented thanks to pillows, artwork, and an area rug. 7. Utilize wall space closer to the ceiling. Bulky bookcases and small living rooms don't make good bedfellows. But that doesn't mean that your perfectly color-coded tomes should live out the rest of their days in boxes banished to the garage. Follow the lead of Anna from In Honor of Design, and utilize all of that empty wall real estate near your ceiling. It will draw your eyes up and free up valuable floor space.